In an interview published this week with Blocks & Files, Toshiba outlined the company will be relying on a mix of hard drive technologies in order to keep increasing hard drive capacities. Along with current-generation two-dimensional magnetic recording (TDMR) and shingled magnetic recording (SMR) technologies, the company will also be tapping both microwave assisted magnetic recording (MAMR) as well as heat-assisted magnetic recording (HAMR) for future drives. Already gearing up to ship its first 16 TB TDMR drives, Toshiba's short-term development plans call for it to adopt SMR as well as MAMR. Meanwhile in the longer-term, HAMR will be introduced for further capacity increases. Earlier this year Showa Denko, Toshiba’s supplier of HDD media, revealed that the company would be supplying platters for hard drives based on MAMR technology. Toshiba has since confirmed their plans to use MAMR in this week's interview, but in an added twist, the company also noted that some of its high-capacity MAMR hard drives will use shingling as well. “MAMR will be used to advance the capacity of both CMR (discrete track) recording and to SMR (shingled track) recording,” Scott Wright, director of HDD marketing at Toshiba America Electronic Components. Overall, It is not a secret that for years now Toshiba has been working on hard drives featuring SMR technology. However unlike its competitors, the company has yet to introduce any commercial SMR hard drives, so these new MAMR + SMR drives would be the first commercial SMR deployment for the company. SMR of course brings some new performance trade-offs due to the read-modify-write cycle introduced by shingled tracks, but it still makes a great deal of sense for high-capacity HDDs since it allows drive vendors to increase their capacities without switching to a new type of media. Toshiba's MAMR-based HDDs will begin sampling later this year. And, accounting for a few quarters for datacenter operators to validate the new drives, we should see their MAMR hard drives to enter volume production in 2020. Looking further out, Toshiba has also said that sooner or later it will have to use HAMR, due in large part to the higher scalability that the technology offers. 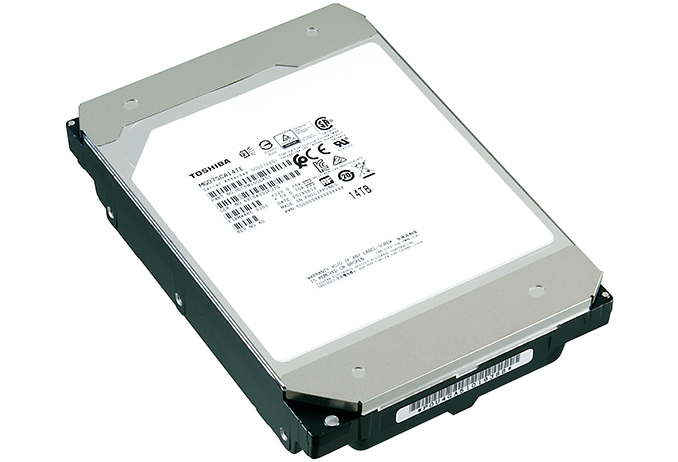 By adopting MAMR for their 2019 – 2020 nearline HDDs Toshiba and Western Digital can continue using HDD media that is similar to platters used today. By contrast, Seagate is set to skip MAMR and use HAMR along with brand new disks instead. Consolidation has been happening for better or worse in the storage industry for decades. I read somewhere awhile back there were, at one point, over 200 manufactures in the magnetic storage industry. It seems Toshiba and WD drives both use a lot of Hitachi technology - they operate and feel very similar even down to the noises they make. You take them apart and see the motors and platters are all the same brands...Showa platters, JVC actuators, Nidec motors, TDK heads...even the cases have the same footprint and controllers are all off the shelf chips from LSI (Seagate), Addonics (Fujitsu) and Marvell (WD\Toshiba). I've even seen the same Hitachi-developed SMOOTH ASIC on WD and Toshiba controller PCB's. M, I don't agree with your last part. We have 4-6 big Players in NAND Manufacturing: Micron with Intel, Toshiba with SanDisk (now WD), Samsung and Hynix. The only acquisition was Sandisk by WD. And Toshiba by a consortium. To buy a Flash-Controller manufacturer isn't a big thing. We have a lot and it's easy for new players to enter the market. Toshiba bought OCZ but since then no controller came off that. Sandforce 3 was canceled. Hynix bought LAMD and no new controller any more. We have controllers from Intel, WD and Samsung itself. Big 3rd party players like SMI, Phison and Marvell. Where Marvell is a bit loosing ground. And some smaller ones like JMicron (now Maxiotek) and new to the game Realtek. Of course there are some enterprise controller in the market like Flashtec too. SSD manufacturer itself have no IP from interest. They relabel SSDs or build them on their own with help of referenz models. Kingston does their own drives and bin their NAND themselves, but that isn't rocket science and the same with some OEM manufacturers.